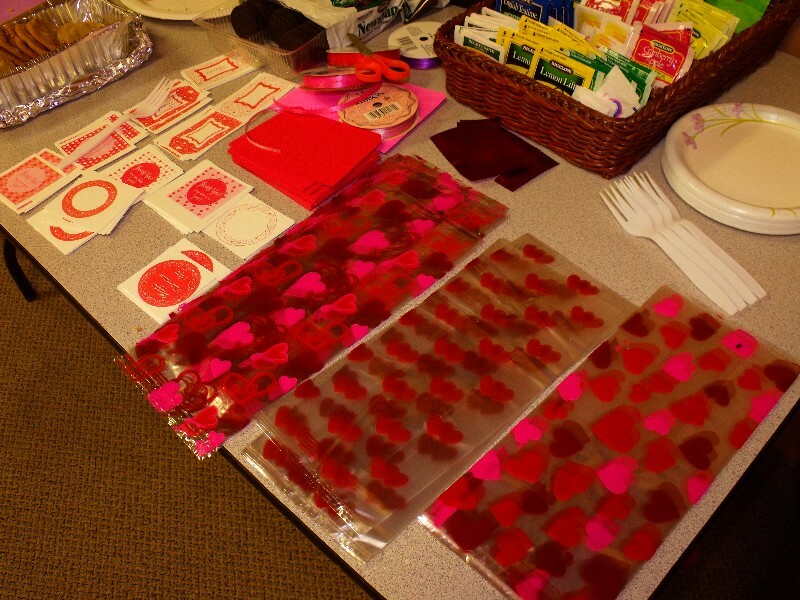 A few years back I was in charge of crafts for our MOPS (mother's of preschoolers) group. 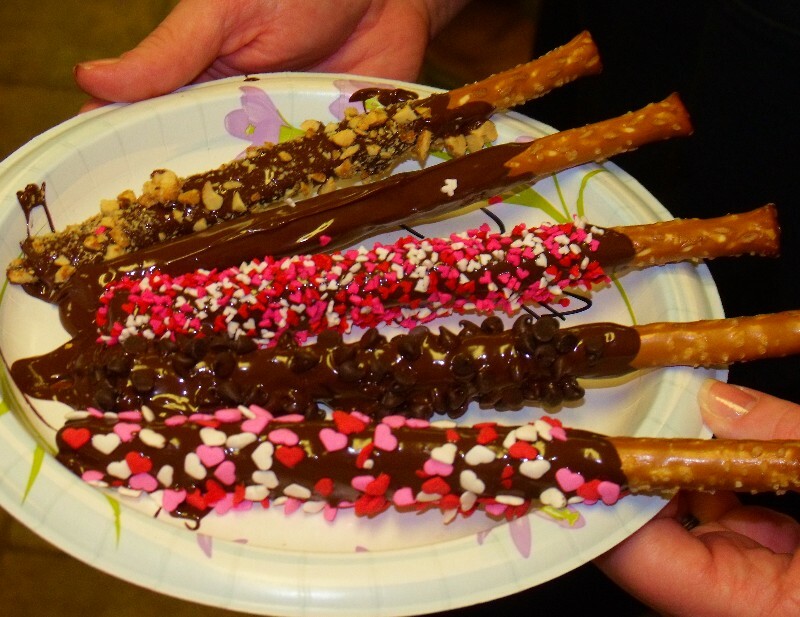 One of our easiest and most fun hands on edible snacks were chocolate dipped pretzel rods. They were a pretty big hit and made for wonderful gifts too. It's really quite simple. 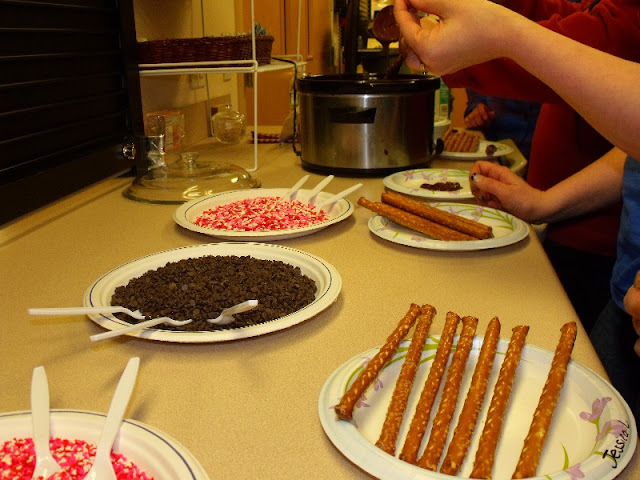 Melt some good quality chocolate chips with a little bit of vegetable oil or shortening, dip in your rods and roll in your sprinkles or toppings. We were doing this on a grand scale of 50 women at one time, so we melted a giant 10-pound bag of chocolate chips from Costco into our crock pot. If you are doing this at home with your kids or grandkids just take a bag of chocolate chips (and a tiny bit of vegetable oil or shortening) and melt for 30 seconds at a time until the chocolate is warm and ready for dipping. It's a good idea to have all your toppings out and ready to go before hand. We chose crushed honey roasted peanuts, mini chocolate chips, heart sprinkles, and red and white sprinkles. Oh and here is a great tip for cheaper sprinkles. Go to your local bakery (Fred Meyer, etc) and ask the baking department if you can buy some of their holiday sprinkles. Often times they can give you a small container of them and you will get a lot more and it will cost a lot less then the tiny jars you get in the baking section. For pretzel rods you want to buy the large ones, they come in a bag (usually in the chips section) but you have to watch out when you are buying them and try to find bags without any broken ones inside. The crock pot was ideal in the fact that is was deep. 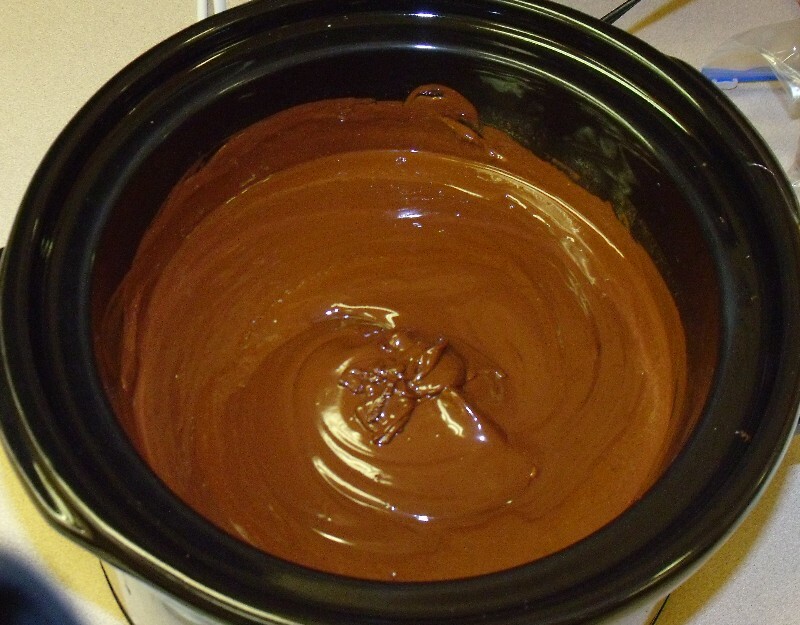 So try to melt your chocolate (if you are doing it at home) in a deep or even long microwave safe bowl so you can maximize dippage. Another way is to spoon the chocolate over the area you want covered, or tip the bowl as you dip and spin the rod in the chocolate. Be sure to leave around 1/3 of the end not dipped for the "handle". The dipping and dunking was the most fun we had that night. 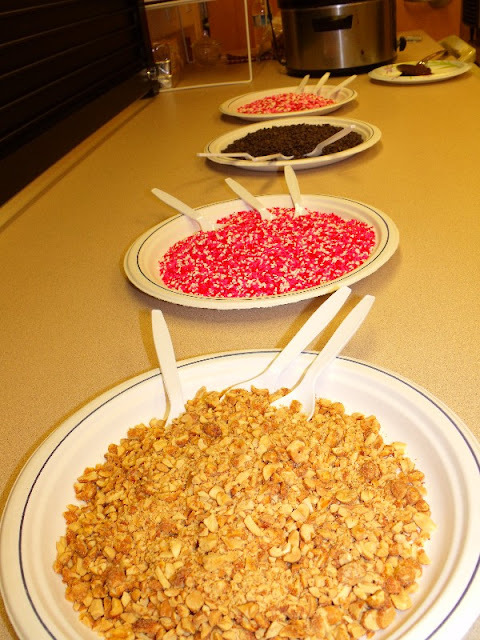 Everyone loved the variety of toppings as well. Because of our time constraints (a little over an hour) we ended up chilling ours in the big church fridge, so we could get to the cute packaging in time. Imagine an unsuspecting church goer opening this baby up and finding liquid-dipped GOLD! Of course if you are making these at home feel free to eat them as soon as your are done making them. 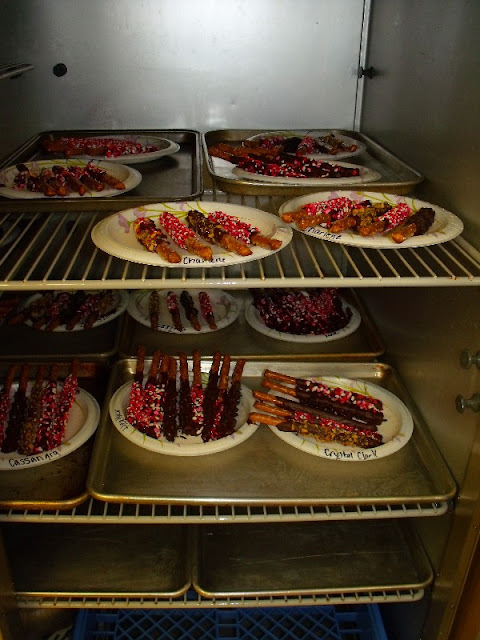 You can also let them cool on wax paper at room temperature, or in the fridge for 20 minutes to set up. Store them in an air-tight container and they are best eaten in a few days. I must say they make great gifts for care givers, teachers, neighbors, and friends. An easy way to package them was only a quick trip to the dollar store away. Some simple cellophane bags in holiday colors (that came with twist ties) and some free "thank you" printable tags, ribbon, and a hole punch was all that was needed to make these treats extra beautiful. 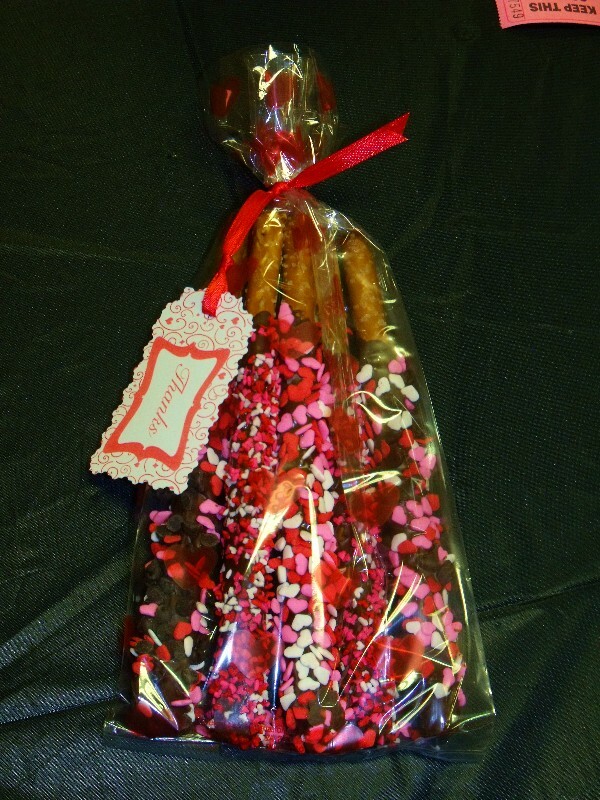 Who would not LOVE to get this as a little Valentine's thank you or pick me up? So there you have it. 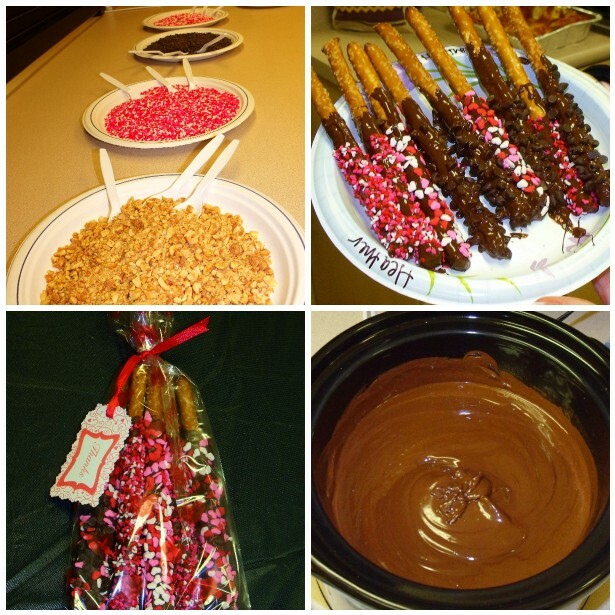 Just a few ingredients and a fun and yummy craft is within your arsenal. This works great for any holiday by the way, just change out the colors of the toppings and the cellophane bags. Enjoy and have a very happy Valentine's day.